As we bid farewell to July, what has been a considerably disappointing month in terms of British summer weather, we thought we'd take a closer look at this month's birth flower which happens to be the Larkspur, or Delphinium as it is also commonly known. The larkspur is a versatile flower that can really add a lot to a bouquet. Interestingly, the name Delphinium originates from the Greek word delphis which translates as 'dolphin' and refers to the the flower's unique bottle-nose shape. Another interesting fact about delphiniums is that the juice of the flower mixed with alum creates a blue ink. In the context of birth flowers, the larkspur is said to represent "levity and lightness." The soft colours and fresh aroma of this flower make it perfect for summer birthday bouquets such as our exquisite Blue Flower Collection. 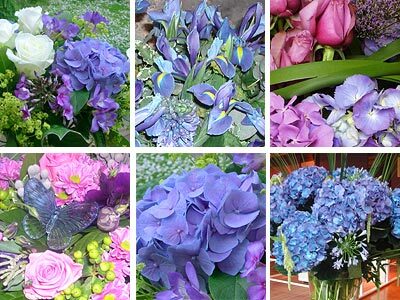 Featuring a selection of blue flowers carefully selected and hand-arranged by our team of professional florists, our Blue Flower collection is ideal for all sorts of occasions. Other connotations of the larkspur include joyousness and sweetness. In birth flower tradition, these are supposedly traits which people born in that particular month share with the flower of the month. Therefore if you are looking for a special bouquet for someone born in July, our Blue Flower Collection would make for a beautiful gesture indeed. So here's to July and the Larkspur, or Delphinium. A unique and attractive flower that will lend a touch of splendour to any bouquet it graces. And here's hoping the summer weather improves somewhat as we transition into August!